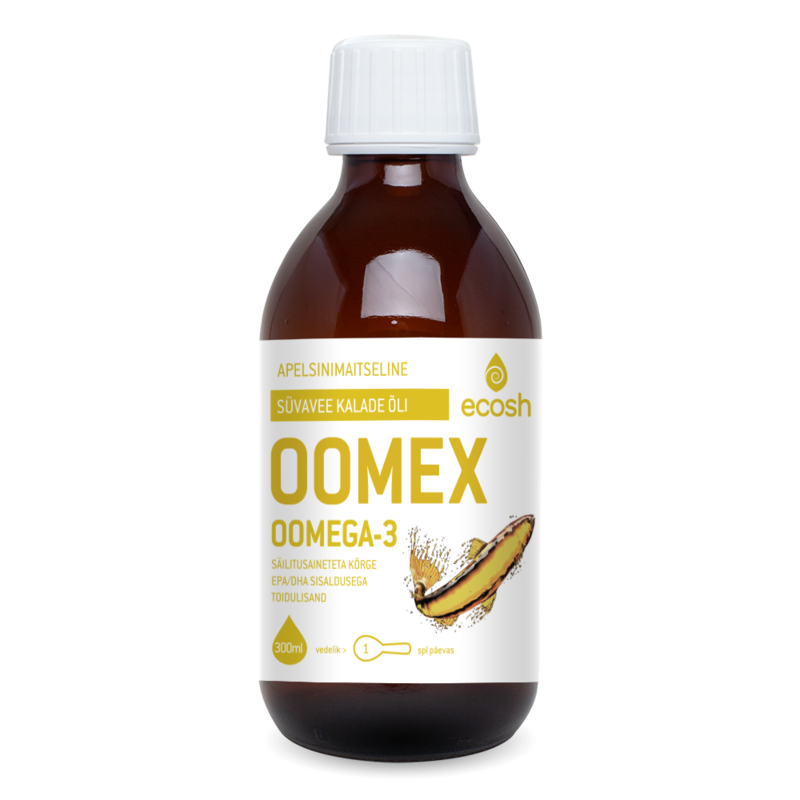 OOMEX fish oil enriched with vegetable oils – with one of the highest yet most optimal EPA and DHA (omega-3) content – helps maintain the normal daily amount of essential fatty acids in the body and supports optimal eye, heart, nerve, brain, joint, and immune function. helps maintain the daily normal content of essential fatty acids in the body and supports optimal eye, heart, nerve, brain, joint and immune function. a product with the confirmation of the international trademark “Pollutants? No thanks!”. Polaris’ advanced technology has been used to purify, concentrate, deodorise (to remove specific fish odours), and to stabilise the Oomex fish oil. Fish oil produced in France is more stable than other omega-3 oils on the market: 3,000 ppm (3 g/l) of tocopherol has been added to the oil / Rancimat test’s value is based on ISO 6886 2015 standards. short-term high-vacuum distillation of oil: from 30% original ratio to 80% ultra-concentrate. Oomex omega-3 is one of the most unique polyunsaturated and essential fats that the body itself cannot produce and which have to be obtained from food. Our body consists of about 3 billion cells, all of which require balanced fatty acids to function normally. Our brain and cell membranes need high-quality fatty acids the most. Omega-3 and omega-6 fatty acids are in each of our cell membranes and their ratio in the body should ideally be 1:1; omega-6 having a higher ratio of 5:1 is considered the highest acceptable level. Too high omega-6 levels cause health problems and chronic inflammation. In Northern Europe, this ratio is 12:1, in Europe 15:1, and in America 25:1. By consuming high quality omega-3 rich fish oil, this ratio can be kept at an optimal level. vision and the development of the whole body. The Ecosh orange flavoured omega-3 product is manufactured from high quality fish oil that is particularly rich in omega-3 fatty acids, EPA, and DHA. The oil is produced from carefully selected short-lived deep-water fish, such as sardines, anchovies, and mackerel, which are the purest omega-3 sources in the sea. In turn, the oil is purified, concentrated, deodorised, and stabilised using advanced cutting-edge technologies, making this oil produced in France one of the most stable and cleanest omega-3 oils in the market. Rancidification is avoided and stability is ensured by the combination of different tocopherols and polyphenol-rich primary cold-pressed and therapeutical olive oil. Polyphenols are strong antioxidants that have many beneficial properties that protect both fish oil and body from oxidation. The aroma and taste are given by orange oil. vitamin D3 helps to maintain normal bone structure, dental health, and muscle function. Administration: For an average adult, 1 tablespoon of oil per day. (Multiply body weight by 0.15. For example, at 80 kg body weight, 12 ml, i.e. 1 tablespoon of oil per day; at 60 kg body weight 9 ml, i.e. three quarters of a tablespoon of oil per day; at 100 kg body weight, half a tablespoon of oil per day). The recommended dose should not be exceeded. Fish oil should not be consumed by people who are allergic to fish. A dietary supplement does not replace a diverse and balanced diet and a healthy lifestyle. Consult your doctor or therapist if you are taking blood thinners and other medicines or are pregnant or breastfeeding. Do not use oil for two weeks before surgery and delivery. Keep out of the reach of children. Storage keep an opened bottle in the refrigerator. Use within 45 days. Product quantity: 300 ml bottle, liquid.